Written by Dr. Muhammad Zohaib Siddiq and medically reviewed by iCliniq medical review team. Our heart works as a pump. As water pump pulls water from back pipes and pushes it to forward pipes, so is the function of our living pump. It receives blood from the body and pumps it forward to the body. Blood contains oxygen and nutrients that our body metabolizes to generate energy, which is required for the body to work. Heart itself needs oxygen and nutrients for energy generation. Heart receives blood through arteries called coronary arteries. When any tissue is deprived of oxygen or other nutrients, it dies. Tissues get deprived of oxygen when there is a block in the flow of blood, that is decreased supply or increased demand. Blood flow to the heart may decrease or cease due to many reasons. Most common is, when there is a sudden blood clot formation in coronary arteries. Heart muscles get damaged when blood flow decreases or when the demand increases. When blood supply gets decreased than the demand of the heart, it causes pain in the chest. This pain is called angina pectoris in medical terms or angina in common usage. When supply gets decreased for a longer time or when demand keeps increasing, a part of the heart tissue will die and it is called as heart attack. In medical terms, it is known as myocardial infarction (MI). Angina and heart attack pain are felt in the center of the chest. Pain usually radiates to neck or left arm and sometimes to both arms and shoulders. 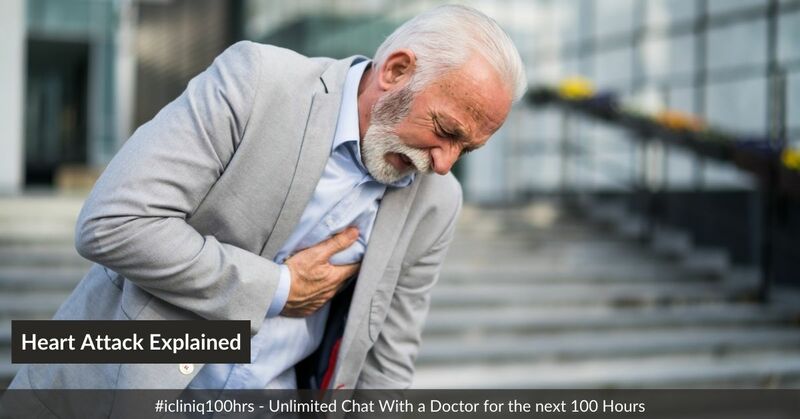 The difference between angina and heart attack is that angina pain occurs when one is very active that is when exerted, such as running, swimming, walking, climbing stairs or cycling. It vanishes when one takes rest. Heart attack pain starts even if one is resting or sleeping and does not vanish on rest or lasts for longer than 30 minutes. First aid for angina and heart attack is to stop any activity and take a medicine, usually Glyceryl trinitrate tablet under tongue. This causes dilation of coronary arteries and the pain will decrease or subside. It can be repeated for two or more times with a five minute interval. Even then, if pain does not subside, then Aspirin tablet should be chewed and cardiac emergency room should be approached without delay. In the emergency room, ECG (electrocardiogram) is done to diagnose heart attack. If there is heart attack, then the next step is to open the coronary artery, which is blocked. It is opened either by angioplasty or intravenous medicine. The choice depends upon the availability of expertise and the patient's wishes. Contrary to common belief, heart attack does not cause sudden death in most cases. Sudden death may occur if the heart stops beating suddenly after attack or when heart's rhythm is disturbed. Keep blood pressure, blood sugar and cholesterol in normal ranges, if suffering from any of these conditions. Avoid sedentary lifestyle and do exercise for at least 30 minutes a day for five days a week. Swimming, jogging, cycling and brisk walking are the best exercises. If already had a heart attack in the past, then apart from all these take regular medicines according to the advice of your cardiologist. Do you have a question on Quitting Smoking or Reduce Weight? Why am I not able to lose weight even after dieting? Can smoking cessation cause strained bowel movements?